Living Grace is bringing back our Christmas in July promotion for 2011. 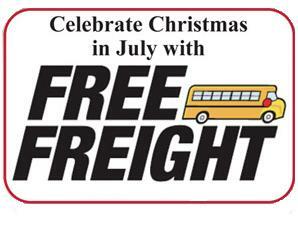 For the entire month of July you will receive Free Shipping on all orders over $500. This is your opportunity to stock up on your supplies for the next few months and you won’t pay a penny for shipping. Purchase your favorite Communion Cups for only $10.99 per 1,000, which is already the absolute lowest price in the industry, and we will cover the shipping for you. Or perhaps you will take this savings opportunity to purchase all of your supplies for the Advent and Christmas seasons. No matter what it is that you purchase, just remember, all orders over $500 will receive Free Shipping for the entire month of July. We have also added 150+ new items to this season’s catalog. View the entire selection of New Items for Summer and add a few to your cart to qualify for the free shipping. All links in this blog are eligible for our Christmas in July promotion, so start placing your order today! Offer expires July 31st.